Vick's not locked into it yet today... Hasn't hit a shot (0-4 overall, 0-3 3-pt) and just compounded the mistake of the bad pass by committing a foul. KJ Lawson headed to check in. #KUbball and Stanford tied at 17. #KUfball players out on the court during the timeout. All the guys who picked up some all-Big 12 honors. Crowd goes wild for Pooka Williams. Crowd goes wild for Pooka as him and his teammates come out onto the court. Dedric Lawson with 13 of the 23 KU points and 8 of the 16 KU rebounds. KU is 0-4 from three. KU hasn't hit a 4 either. 51.7 percent of Stanford's shots have been from deep thus far. Entering today, the Cardinal attempted a 3-pointer on just 34.5 of their shots. Mini Haase hits another 3 for Stanford. KJ Lawson hits 2 at the line to KU with 4. Stanford up 35-29 at the half. KU down 35-29 at halftime. Jayhawks' offense was basically nonexistent when Dedric Lawson wasn't taking over. KU had 1 assist in first 20 minutes. Les Miles came out at halftime and ate some grass to the crowd's delight. Then he gave a kid free Yeezys. This has been your #KUfball Les Miles update. Les Miles, from OUT OF THE #KUbball CROWD!!!! Wow. Dude is going for it. 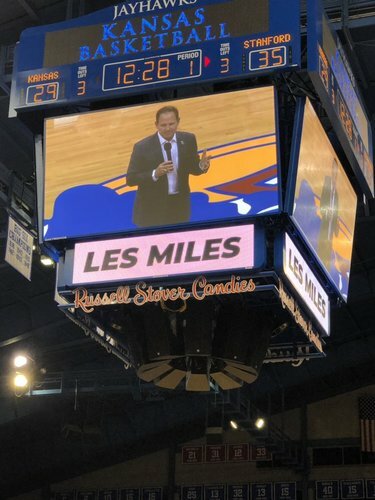 Local celebrity and football coach Les Miles introduced during halftime of #kubball game at AFH. #KUbball has just one assist after one half of basketball. KU's lowest assist total in a single game since 2010 was 4 during its 72-40 loss to Kentucky in 2014. 2nd half under way... #Kubball trails Stanford, 35-29. Stanford with possession. Stanford quickly went up 10... Definitely looks like it matters to Stanford more right now. Plenty of time for #KUbball to change that. KU getting worked early in the 2nd. Bad defense and even worse offense. Stanford opens 2nd half completely locked in and out-hustling #KUbball . All 8 2nd half points for Stanford in the paint. KU with 1 assist. 1. Just one. Refs can't decide with they want to let stuff go or call weak fouls. Jayhawks are 1 of 8 from deep. Guard 3 point shooters is clearly a problem.